Dr. Christine Rigsby and Dr. Karmen Lenz are shown in the image on the right. Photo by Hannah Hartman. The other image shows students in the class during the optional pig heart dissection. When Jahi Mendes registered for Dr. Karmen Lenz’s early British literature course, the last thing he expected to see on the syllabus was a heart dissection. For the past four years, Lenz, a Middle Georgia State University (MGA) English professor, has worked with cardiovascular specialists in the Department of Natural Sciences. Lenz felt inspired by the scientific revolution that occurred during the Renaissance, an era that also birthed a new wave of art and literature. During the 17th century, physician William Harvey conducted heart dissections. His findings proved the heart to be an electrical pump, effectively overturning “abstract classical theories of the heart’s function and making heart transplants possible today,” Lenz said. 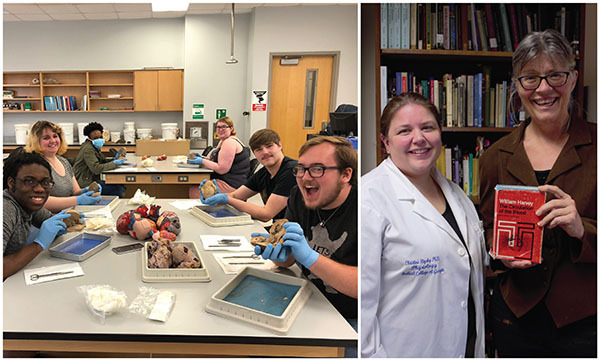 Aided by Dr. Christine Rigsby, assistant professor of biology, Lenz teaches early British and early world literature courses in which the pig heart dissections take place. However, Lenz and Rigsby understand that some students are not too keen on slicing open a pig’s heart. Those who are squeamish or wish to opt out are given the opportunity to study detailed sketches of hearts by Renaissance artists such as Leonardo Da Vinci and Andreas Vesalius rather than participate in the dissection. “We keep the project flexible as an extra credit option,” Lenz said. Mendes, a junior at Middle Georgia State, decided to participate in the dissection out of sheer curiosity as to how modern science and centuries old writings overlap. Mendes learned a lot from the course academically, and he also learned more about himself. Mendes highly recommends the course to fellow MGA students, especially those interested in international cultures. Lenz and Rigsby’s collaborative early world literature class will be offered again during the spring 2019 semester. The writer, Alexandria Brooks, an interdisciplinary studies major at MGA, is an intern for the University's Marketing & Communications office.